From a State Department insider, the first book recounting our misguided efforts to rebuild Iraq—a shocking and rollicking true-life cross between Catch-22, Dispatches and The Ugly American. Charged with rebuilding Iraq, would you spend taxpayer money on a sports mural in Baghdad’s most dangerous neighborhood to promote reconciliation through art? How about an isolated milk factory that cannot get its milk to market? Or a pastry class training women to open cafés on bombed-out streets without water or electricity? According to Peter Van Buren, we bought all these projects and more in the most expensive hearts-and-minds campaign since the Marshall Plan. We Meant Well is his eyewitness account of the civilian side of the surge—that surreal and bollixed attempt to defeat terrorism and win over Iraqis by reconstructing the world we had just destroyed. Leading a State Department Provincial Reconstruction Team on its quixotic mission, Van Buren details, with laser-like irony, his yearlong encounter with pointless projects, bureaucratic fumbling, overwhelmed soldiers, and oblivious administrators secluded in the world’s largest embassy, who fail to realize that you can’t rebuild a country without first picking up the trash. Darkly funny while deadly serious, We Meant Well is a tragicomic voyage of ineptitude and corruption that leaves its writer—and readers—appalled and disillusioned but wiser. Here’s a full chapter, 14 page We Meant Well Excerpt! There is a rich body of fiction describing the darkest episodes in American economic history. The Grapes of Wrath by John Steinbeck, and John Ford’s masterful film of the book , stand out, and both obviously informed my writing. Before writing Grapes, a work of fiction, Steinbeck did a series of seven nonfiction pieces for the San Francisco News, and a piece for The Nation, documenting conditions in the migrant camps of central California. The author also traveled the same Route 66 used by the Okie families before creating his “made up” story. Steinbeck’s close friend, Thomas Collins, was a Farm Security Administration employee who worked in the Arvin Sanitary Camp, giving him access to the families and many written documents. Collins went on to serve as technical adviser to John Ford. Steinbeck’s famous quote, “Socialism never took root in America because the poor see themselves not as an exploited proletariat but as temporarily embarrassed millionaires,” hums in the background of my own work. Two other books worth reading along these lines are Appointment in Samarra by John O’Hara and Winesburg, Ohio by Sherwood Anderson. 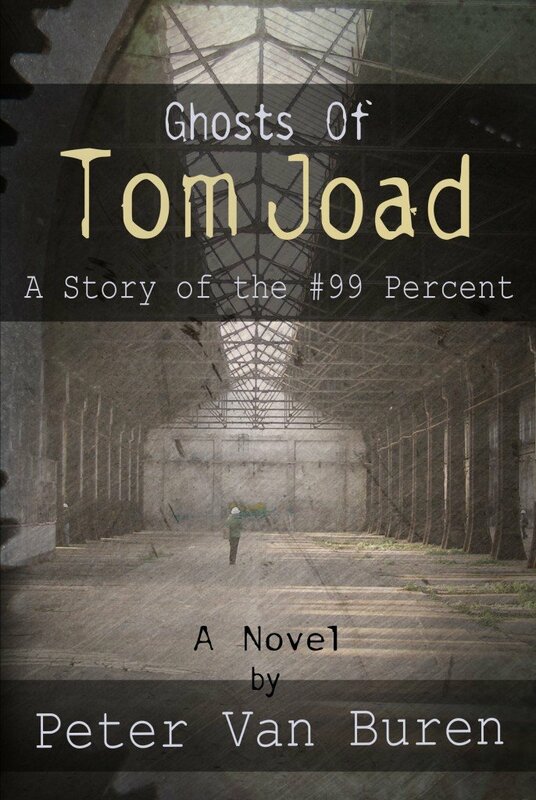 My fictional town of Reeve, Ohio in Ghosts of Tom Joad is located “near” the more famous fictional town setting of Samarra’s Gibbsville, Pennsylvania and the actual Winesburg location of Clyde, Ohio. Written contemporaneously, these books captured the uncertainty and fear of their times, as no one writing knew how the Depression would end. Bruce Springsteen wrote several of his more poignant songs about working life on the album The Ghost of Tom Joad . Springsteen is the most relentless and prolific chronicler in popular culture of the plight of the working poor, picking up the job from Dust Bowl singers like Woody Guthrie . Angry but ebullient, Springsteen believes that a new era will follow deindustrialization and that the men and women he writes about will survive into it. I wrote the basic outline of the chapter in Ghosts, Summer Storms, as a college student in 1981. I got an B+ on the assignment (I am hoping for an A- this time around), the professor saying people would not care to read about Ohio’s troubles. We’ll see if he was right or not. I scribbled down those ideas when I was about the main character Earl’s age, and wrote the rest of this when I am about his father Ray’s age. Along the way I have heard commentator after commentator, politician after politician, talk about reviving the middle class, bringing back jobs, returning manufacturing to America, how high-tech industries will solve everything, on and on. Instead, over the forty years between Ray and Earl, more people are in poverty, with less money devoted to education and fewer jobs. There’s still a lot of hope out there, young people so smart, older folks working true, as a counterpoint. It has been a long bus ride for Earl, for me, for us, but right now I am not sure where our collective journey will end.